Honey Badger says "You got your chocolate in my peanut butter! Now I have to kill you. Then I'ma enjoy this new treat...."
That's actual history folks. 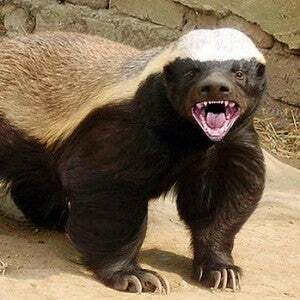 The honey badger that first marketed it was named Reese. And nobody touches Reese's Peanut Butter Cups! Not if they want to keep their fingers, that is. Have you seen the teeth on that thing? But let's get started, shall we? Put on your science hat's because, it's Tell The Truth Tuesday! Today I reveal the truth behind yesterdays post. And the truth is, I lied. It is true that otters and honey badgers are cousins. They are both in in the family Mustelidae. But there are four sub-families in that Super-Family. Otters are in the sub-family Lutrinae, while honey badgers are in the sub-family Mellivornae. They are not only different species, they are also of a different genus. Otters closest living relatives that aren't other otters are in the sub-family Mustelinae. That sub-family includes weasels, martens, polecats and wolverines. They are so closely related that they share mitochondrial DNA. Interestingly enough though, many taxonomists categorize the super-family as just 2 sub-families; Lutrinae and Mustelinae. The sub-families of Mellivornae, (the honey badger), and Taxiidnae, (American Badger) are tossed in with the sub-family that shares DNA closely with otters. So, tl;dr - Related? Yes. Able to produce babies? No. Hope that wasn't too science-y for you. I have told you in the past of some weird foods. This one really takes the cake. It eats the cake. Then it vomits the cake up and tries to pass it off as desert. Before I name this food, allow me to tell you about the creature from which it comes. It is known as the Greenland Shark. It's a fairly good sized shark that could eat a swimmer if anyone was stupid enough to swim in the arctic. They are so voracious that, one was found to have an entire reindeer in it's belly. So, big, hungry shark. It's really slow, though. All it's energy needs to go towards heating it's body, so it doesn't swim fast. Most of it's prey is caught through stealth. Here's the thing; the Greenland Shark's flesh is toxic. Even a little bit will make you sick, and enough will kill you. Why is it toxic? Because this particulars shark's flesh contains a very high concentration of urea. MmHmm.....that's right. You correctly remember what urea is. It's urine. Pee. See, the Greenland shark can't urinate. Instead of the kidneys filtering out the toxins and sending them on to the bladder to be pee'd away, once the toxins leave the kidneys, they are reabsorbed into the shark. But have no fear! Our friends the Inuit have discovered a way to eat this toxic beast. This sounds delicious, doesn't it? But wait! There's more! If you travel to Greenland and visit some Inuit natives, and they offer you some Hakarl, do not eat it! Even though it's gone through this process, unless you have the correct diet, it will still be toxic to you. That's right. Even though the process makes it safe for Inuit to eat, it's only because of what's in the rest of their diet. (lot's of fat and fish oil). MmmMmm Good! If you do decide to try it, make sure you follow it up with a native dish from Iceland; Kiviaq. What's that? Oh, it's just a small bird that's related to the Puffin. They trap it and then sew it into a seal skin and then bury it for three years. After it ferments in it's own juices, it's taken out and eaten. It's reported to look and smell disgusting. Also, it has the potential of carrying botulism. So...you know....someone call Andrew Zimmern.